Payment at the time of consultation is required, EFTPOS is available, cheque or cash is also accepted. 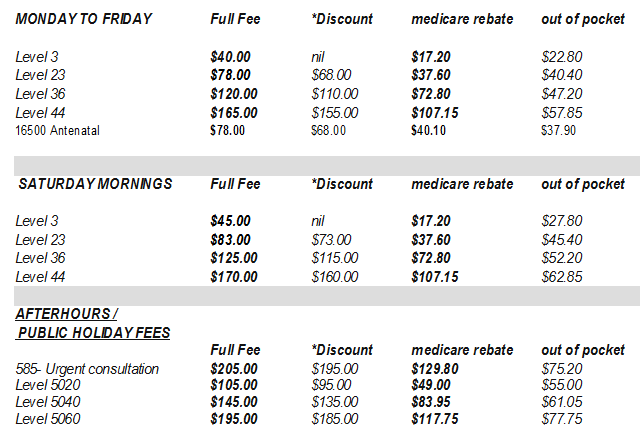 Billing practices vary with each doctor, and a schedule of fees is available at the reception desk. Our Doctors don’t routinely “BULK BILL” to Medicare unless you have a current Commonwealth Health Care or Pension Card, Eligible Veterans will be bulk billed. 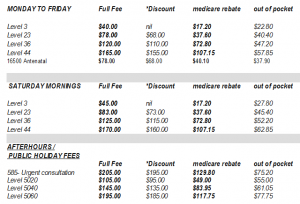 Patients with Commonwealth Seniors Health Care cards are offered a discount fee. If our fees cause difficulty, please mention this to the doctor privately at the time of your consultation. Childrens scheduled immunisations with our nurses are all BULKBILLED as are patients having appointments with our nurses for CDM ( Chronic Disease Management) or Health Assessment appointments.